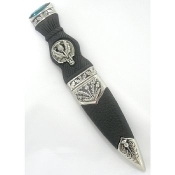 Traditional 4-piece metalwork dress sgian dubh, featuring Thistle design. Plus, choose a clan crest to accent. A variety of stone options are available to coordinate with other outfit components. Made by Gaelic Themes of Scotland. Please allow up to 2-3 weeks for delivery. Made in the UK.